Wish someone an extra special happy birthday with a dozen fresh strawberries dipped in pure dark chocolate. 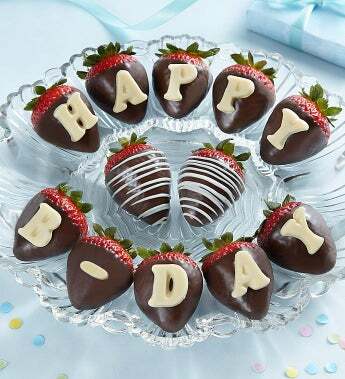 These Happy Birthday chocolate-covered strawberries, each of which is hand-dipped, actually spell out the special occasion in white chocolate lettering. These extra large berries arrive in an elegant gift box.